After the annual sausage making party (100 lbs this year) and a lot of laughs; I decided to ride the 20 mile loop that is integrated into the 60-mile challenge. The course for the 60 miler's is two loops,with the first being around 40 miles long, and then returning to the start area where it continues to a second 20 mile loop. I pumped up the 1.8 tubeless tires on my old Vassago to 30 pounds, and then headed out of the parking lot at the Carlton Reserve. After a short asphalt section and a wrong turn down the power line, I was finally on the right track for a great ride on the beautiful sunny and windy day. The first section of gravel is short but is a hard and fast surface, and just what I needed to clear my head and warm up my legs. After this comes a short grassy section. Gravel after short road section. We like to call this SCORR grass: short grass covering a hard trail, and it feels almost like riding on carpet. 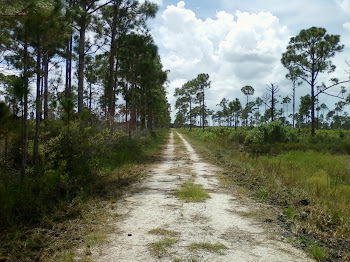 As soon as I jump onto the South Power Line Trail, I know that I will be riding on gravel for the next 10 or so miles. After this section comes the Venice Arcadia grade, then Well field rd. This will be a section that allows riders to make up some lost time or take a break into a steady pace. As usual it is a great area to spot deer and pigs. And as I ride through this area, I begin to get into the pace of things, and I feel like I am moving along quite well. Of course, the tail wind didn't hurt either. Around mile 11 I take the right turn onto Stockade trail that is a mix of gravel, grass carpeting, and short sandy sections. This area is driven frequently by the Pig trapper so if you follow the same path as his tires you will find it to be easy going. I manage to follow the truck's path most of the time, having to change lanes a few times. This road starts out nice, but eventually gets much more challenging. "Am I supposed to sweat so much? It's not even that hot out." Stockade grass and gravel mix. At the top of Stockade I stop for some replenishment; something sweet and a few sips of water. As I was standing there, I looked around for a few minutes to enjoy the isolation of this particular spot. This really is on of the best parts of riding at the Carlton, you can be completely alone and far from everything in just a few miles. As I go back into the saddle for another push, I take a left turn at mile 13 onto the River Trail. Now it is time to pay attention again, as this section has taller grass and few hidden bumps here and there. I find it is easier to push a bigger gear at a slower pace to keep my body loose so it is ready to respond to the sudden bumps. The terrain changes constantly from smooth to bumpy or sometimes soft. Patience my friend, and you are almost done. The rough stuff ends around mile 17. Thanks Piggy! Typical pig damage. As the River trail crosses the South Power Line Trail it becomes the Wild Turkey Trail. Time for a celebration, as the rough stuff is behind me and now I just have to cover the last few miles back to the parking lot. This 20+ mile loop is a great way to experience some of the best mixed terrain riding of the Carlton Reserve, it will be a fitting finish for the 60 mile riders. I recommend you load up the route on your GPS or mark it on a map. Pump up your tires, and go to experience the loop for yourself before Piggy's Revenge! Reserve your spot, Sign up today! Follow the link below for the route map.